Mini Banana Bread Cake Recipe - Ethel's Baking Co. Ever wonder what you are going to with those extremely ripe bananas on the counter? Do you have an upcoming party or event that you need to bring a dessert that everyone will love? Look no further! These easy-to-make and oh-so-sweet mini banana break cakes are great for everyone from kids to grandma. 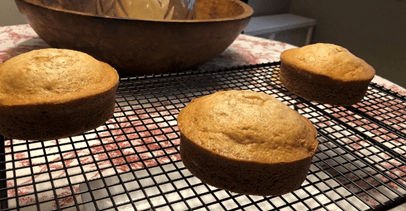 You can also tailor this recipe to make banana bread cupcakes, banana bread bundt cakes, or any other banana bread dessert that you can think of! Follow these simple steps to create a perfect banana bread dessert! Mix butter and sugars on medium speed for 30 seconds. Add eggs, vanilla, bananas on medium for 30 seconds. Mix in dry ingredients on low until combined, do not over mix. Bake for 16-20 minutes. Insert toothpick. It should come out clean. Cool for 5 minutes. Slide knife around edges. Turn out on cooling rack. Cool and frost or serve warm with ice cream or fresh whipped cream.